I cant get a picture to upload onto my web page from either my file manager or computer....i had no problems last night and they are all pictures i've had on before. It appears to be loading but just hangs on retrieving photo. If that does not work, please could let us know what browser and version you are using? Eg. Internet Explorer 7, Firefox 3 etc. I have this same issue since last nite. I have 3 different web browsers on my computer and tried it in all 3 and it still had the problem. I have also ensured that all cookies are accepted and have cleared my cache. I am currently uploading products to my estore so this is especially frustrating. Yes, that does sound frustrating! We recently released a feature that would automatically optimize images added using the Picture Widget. We are investigating the cause and hope to have a solution soon. In the meantime users report that when they refresh the page or navigate away and try again the problem corrects itself. 2. Click "insert picture" on the text editing toolbar (the icon that looks like a green tree in a picture frame, roughly in the middle of the toolbar). 3. The File Manager will open up and allow you to browse for and select an image, as described above. 4. Using the Text Widget allows you to insert a number of pictures in the same text box. You can add as many pictures in a row as your chosen style will support. Separate each picture by one or two spaces for the best results. Alternatively, if the image file was already in the File Manager, you can try re-uploading your image and then adding to your page through the Picture Widget. If neither of these solutions work for you , please let us know. But I will try your suggestion. Hang on be right back.. Worked like a charm!!!!!!!! Thank you so much! i was trying to upload a banner on my home page. This doesnt really work for my product upload. I have all of my images a certain size and use a direct link attached to the image to open in my photobucket. If you click one in fragrances you will see what i mean. So i actually cant continue to add products to my site which makes me very sad. 1. Drag and drop a text widget on to your page and add the image by clicking on the "Insert Image" icon in the Text Editing toolbar (the one with the green tree). 2. To make the image into a link, click on the image and then click on "Insert Link" icon on the Text Editing Toolbar. 3. Save and click on the "Publish to the web" button so your site so that your changes will be reflected on your live site. We understand that this might not be the optimal way to do things right now, but we are working on this and hope to have the issue remedied soon! Thanks so much for your patience and let me know if you have any trouble with this. actually the choose a link does not appear in the properties side bar when i use the method you are suggesting. Oh so sorry! I made a mistake in those directions which I will edit as soon as I finish with this comment. It is not the Properties area that you need to use, but the Edit Toolbar. When you click on the image, then click on the Insert Link icon on the Text Editing Toolbar. Sorry for the confusion! Thats okay...but it doesnt matter actually because as i mentioned i need my images to be of the same size. I have way too many products to enter to begin using a different method. I'm sorry that won't work for you Susan. We are working on this and we will let you know as soon as a fix is in place. I hope it gets fixed soon!! Thank you, your suggestions have been much appreciated. Are there still problems with the photo upload because i'm still getting the same message. We have released a fix for this bug so you should be able to add images again! Thanks so much for your patience while we worked on that, and please let us know if you have any further troubles. Just checked it and it loaded with no issue at all!!!!!! Off to see if i can now use the photo widget as apposed to the text box and "add image"
Hi Leonardo - have you been able to follow the steps we've outlined above? From the beginning of the post - if they still don't help, please could you post the URL of your site so that we can take a look and could you let us know what happens when you try to add a picture. Thanks Marije for reply theirs no actual finished website to speak of I'm just starting out from step 1 building a site using Mozilla Firefox and note pad and i got to the part where you upload an image which i take from my pictures in documents but i just get an icon or red cross where the image should be its probably cause my lack of knowledge or something Ive missed, but I'm still in same situation, images wont load, somebody said it might be I've got the image file in the rung format just dunno. Hi Leonardo - it sounds like you're trying to paste the image from you computer into the Sitebuilder. 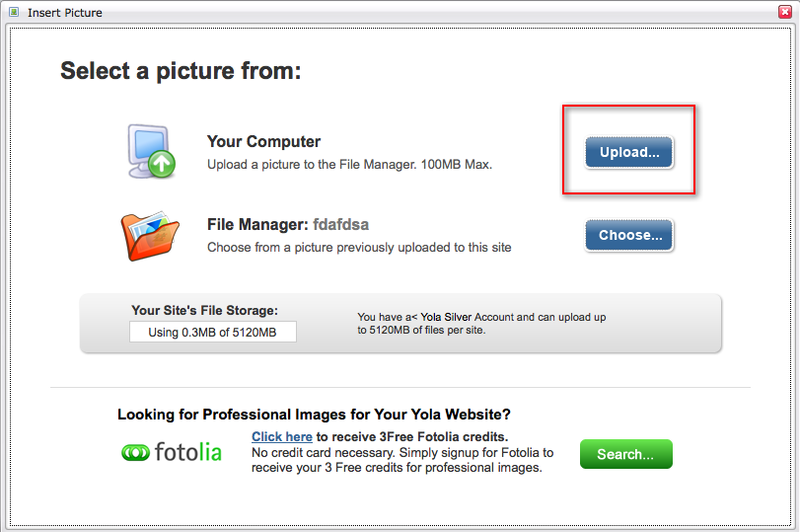 You'll need to upload it from your computer into the File Manager on Yola. You can find the steps on how to do that on this link: http://www.yola.com/customer-support/.... There are steps on using the Picture Widget or inserting pictures in your text. If that's what you're doing and it's not working, can you send us an email so that we can take a look at your site (we'll also need the file you're trying to upload). ayyy i know its irritating. im trying to make a website called "justinsgirls.com" on yola and it takes FOREVER to upload one picture!!!!! its damn annoying! 1. What size and format are your pictures? If you have smaller file sizes, they will be quicker to upload. 3. What type of internet connection are you on and how fast is it? The slower the internet speed, the slower the upload of files. It wont let me click on the button to upload and it will only let me get pictures from my file manager. It wont even load when I click on it! Just nooooooo response!!!!! ahhhhhhh! HELPPPP! I'm really sorry to hear you are having trouble with this. Is this the button you are not able to click on when you are adding the image to your site using the Picture Widget. 2. Please check to see that you have the latest version of Flash installed, for more information please click here: Version Test for Adobe Flash Player. 3. Try loading the site in a different browser (eg. Firefox, Safari, Internet Explorer). We would suggest using the Firefox browser as this browser seems to work best in the Yola environment. It is a free download if you would like to give it a try: Download Firefox. Please let me know how this goes for you! I am all around stuck. My cookies and cache are cleared and I have an updated version of flash. Please see my answer to your question on this post. Please don't double-post, but stick to one post on the same matter. We will always look at every single post and reply if the problem hasn't been solved. If my answer doesn't help you, we will need your URL or login e-mail address (not your password) to investigate on your Yola account. Thanks.